seven survival tips could save you. ﻿﻿﻿﻿Though the park was unfamiliar territory, the couple had hiked rugged backcountry in a nearby area many times. The weather was pleasant — sunny and warm during the day, with an evening chill necessitating jackets and warm sleeping bags. Their annual trip out to West Texas began like all the others but ended in life-or-death drama. They set out on a day hike, just as they had so many times before, with a little water but not much else. The hike wouldn’t take long, so they opted to travel light and planned to return to their campsite long before dark. He snapped photos of her against the dramatic scenery as they made their way along the trail. Misinterpreting the small-scale map they had brought to guide them in the 300,000-acre park, the couple hiked farther than they had anticipated, eventually reaching a scenic overlook. Tired and out of water, they decided to spend the night on the high ground. The next morning they found the trail, but recent floods had washed away trail markers in the rugged park, and they lost their way again. Luckily, they found a spring and refilled their bottles, but accidentally left a fanny pack of food behind. They spent another night sleeping in the wild — cold and wet, scared and exhausted. By the morning, the woman could no longer continue, and the man made the difficult decision to leave her to find help. He succeeded, but it took days to find her in the vast backcountry. One hundred nightmare hours later, she was found and rescued. A few more hours and she might not have survived. It’s a true story from 2013. Similar ones have been repeated over many years in many locations. If you’ve ever been lost, it’s an experience you never forget, especially that first moment when you realize your predicament. It takes only a moment to lose your way. Lost! Which direction to head? You give a shout out, but there’s no response. The next shout is louder, but still no answer. Panic begins to rise in your throat as you make decisions that will decide your ultimate survival. If you haven’t taken a wilderness survival course, using these seven tips could mean the difference between life and death. Staying calm is a key element of survival. Your most important survival tool is your mind. People make bad decisions when they become panicked, anxious or depressed. Train your mind to calm down and think logically. Though much easier said than done, this is a necessary first step. “Will over skill” is more than half the battle. Two key ways to developing a survivor’s mentality is to become at home in nature by spending time outdoors and practicing essential survival skills. Your best remedy for a wilderness survival situation is to avoid one to begin with. To do so, plan and prepare in advance, leave a trip plan with loved ones and stick to that plan. Study your area of travel in advance. Peruse maps, aerial photos, websites, books and other resources. Develop a solid mental picture of the area. Know the location of rivers, roads, railroads and other key features before you head out. As you venture into the backcountry, remain continually cognizant of your environment: the sun’s direction of travel, prevailing winds, and the weather and cloud formations. Use rocks or sticks to mark your trail. Keep a visual log of landmarks, both large and small, and make a mental note of where you are in relation to them. Occasionally turn around and look back at where you just were so you can recognize places you’ve been from many angles. Use games and songs to remember your route. The entire family can participate in creating a rhyme, song or story that continually grows, recording your trail, as you walk along. For example, “I saw a tree with a crook!” and “It came shortly before the brook.” Put it together and reinforce. “A tree with a crook was before the brook.” This will help you recall landmarks in the correct order. Should you become lost, stay put. Rescuers will begin their search from the “point last seen.” The farther you move from the epicenter of their search, the harder it will be to find you. Additionally, you increase your risk of injury while decreasing your energy reserves by moving about. Your best chance of survival lies in your ability to settle in, be patient and make every effort to communicate with rescuers. 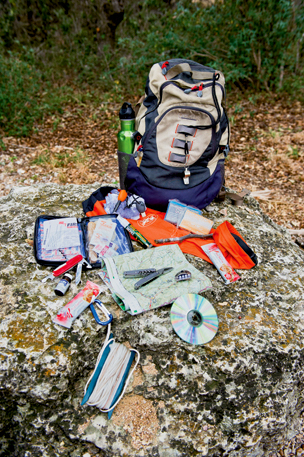 ﻿A basic survival kit includes a first aid kit, pocketknife, water purification tablets, cord, whistle, water bottle, fishing line, signaling device and more. When it comes to distress signaling, just remember “Number three means please help me!” Three is the universal number for distress. Your survival kit should include audible signals such as whistles or horns. Three blasts with a five-second pause between each is the universal distress signal. The same “rule of three” is true of visual signals. Three fires arranged in a triangle or, in a pinch, three large piles of rocks or any triangle visible from the air will help. In your survival kit, keep a DVD or mirror for producing a reflective signal that can be seen from the air. Three short, three long, then three short flashes make up the SOS signal. Your situation will determine which of these four essential elements is the most pressing. If you are caught in a downpour and the temperature is plummeting, shelter (to protect yourself from the elements and prevent hypothermia) is going to take precedence. However, if it’s dusk, the weather is fair, but the air is chilly and the mosquitoes are biting, building a fire may be your first step. This all comes back to maintaining presence of mind so that you can use your best judgment and make decisions to improve, rather than degrade, your situation. That said, most experts would agree that at some point, building a fire will become critical. Fire plays a key role in relation to the other components — shelter, water and food. A fire will warm a shelter, purify water and cook food as well as signal to rescuers, repel insects and more. Therefore, we place fire at the center of the triangle, with food, water and shelter making the three points around it. Remember the Triangle of Life and you will have your key survival strategy at hand. Having a fire will also provide you with considerable peace of mind. Tools to start your fire run the gamut — matches, lighters, fire starters, magnesium blocks, batteries or a primitive fire plow or bow and drill. All help produce heat and spark to ignite your fire. Know how to start a fire using several of these. You will also need dry tinder, kindling and fuel. Bring along your own tinder to assure you have something dry at the ready. Dryer lint in a sealed plastic baggie adds little weight or bulk. Remember that heat travels upward, so arrange the fuel in such a manner that the smallest, easiest-to-ignite material is on the bottom, with the larger fuel (which requires more heat) directly above it. Light your starter while holding it, and once it is burning well, place it at the base of your fire framework. As the fire grows and the heat travels upward, the larger material will ignite. Once the fire is blazing, be sure to keep it well fed. If your firewood is damp, always have the next logs you plan to burn warming and drying on the side. 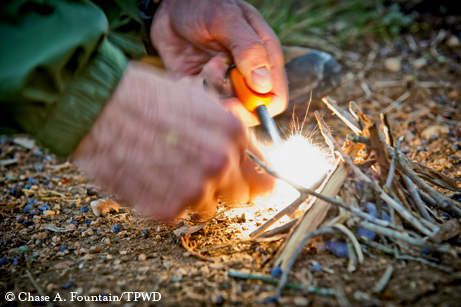 Practice your fire-building skills as well as your water procurement and purification skills. A true survival situation is not the time to learn by trial and error. Under normal conditions, the average adult needs two to three liters of water per day. Heat, arid environs, injury, stress, increased activity and other factors can all increase water needs. In favorable conditions, you can survive on a ration of one-half liter of water with a couple of teaspoons of sugar per day for about a week. Always carry water when venturing into the backcountry. However, in a survival situation, supplies will invariably be exhausted, and the need to procure water will become critical. You can build a still to capture moisture in the air by digging a small pit in the ground and placing a container in the center of the hole. Add green vegetation around the container to increase condensation, then secure a plastic tarp over the pit, pinning down all sides. In the center of the tarp, directly over the container, place a rock for weight, to create a funnel. As condensation gathers on the underside of the tarp, the water will drip into the container. Rainwater can almost always be safely harvested. Your survival kit should include a large sheet of plastic for this purpose. If you don’t have plastic sheeting available, you may need to resort to using a hollowed-out log as an impromptu trough or even a spread of large, nonporous, nontoxic leaves. You may also find water trapped in rocky crags, low-lying depressions and natural drainage ditches. Filter and purify water from such sources. Filter your water by pouring it through a pile of dirt, sand, rock, gravel or fabric. Purify with iodine tablets and boil for 10 minutes. A metal water bottle or canteen is best. Don’t have metal? Build a still and modify it to purify surface water. Start a fire to heat rocks or produce hot coals. Instead of green vegetation as before, place the hot rocks or coals inside your still. Use a hat, shoe, etc. to collect water and pour over the hot rocks or coals. Close the plastic tarp and let the steam gather and drain into your collector. Water can also be found in the ground. Dig about 10 feet from a streambed in an area free of animal signs. Look for vegetation that can indicate water below the surface, such as cattails or willow trees. Once again, if you remain calm and think clearly, creativity and improvisation will take you a long way. Exposure to the elements can be serious. When the sun, wind, rain, cold or other environmental conditions threaten to undermine the stability of your body temperature, finding or building shelter takes precedence. Act promptly. Do not wait until hypothermia or heat exhaustion renders you physically incapable of building a shelter. There are no hard and fast rules about shelters. They should provide insulation against the elements. They should be big enough to lie down in comfortably and small enough to trap and maintain your body heat. When it’s hot outside, a shelter should provide airflow and protection from the sun’s rays. A north-facing, shaded rock overhang makes for good shelter in the heat. To make a lean-to shelter, tie cord between tree trunks or branches and attach a poncho or large trash bag. You could also use branches or bamboo as stakes to hold a plastic covering in place over a pit. Not in a forested area? Sand or rocks will serve to pin your cover in place. To add insulation to a shelter, gather nonpoisonous leaves, grass, hay or needles that are free of biting and stinging animals, reptiles or insects. When planning your shelter, consider how quickly you need protection, the materials you have on hand, your skill level and the time and effort required to build it. Which materials will offer the best protection from the sun? Heat? Wind? Rain? Does your shelter’s location provide access to a good vantage point to see or signal to rescuers? Have you made sure it’s not subject to falling rocks or limbs? Did you take into consideration signs of animal traffic and behavior? Are you above high-water marks in the event of flash flooding? Beyond location, consider also the orientation of your shelter. Does it maximize natural wind barriers or take advantage of cooling airflow from predominant winds, changes in vegetation or nearby water? Once you have seen to your basic needs, console yourself in knowing that you were able to accomplish these critical feats. Focus on getting found and be patient. Help will come! 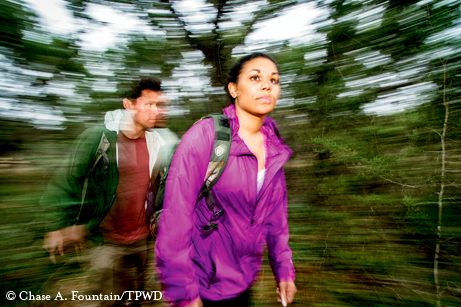 To learn more, take a wilderness survival course or any of TPWD’s many outdoor skills workshops, held regularly at a variety of state parks around the state. Find one near you here: www.tpwd.state.tx.us/calendar/outdoor-skills-workshops-seminars.